Vlissingen is a municipality and a city in the southwestern Netherlands on the former island of Walcheren. With its strategic location between the Scheldt river and the North Sea, Vlissingen has been an important harbour for centuries. It was granted city rights in 1315. 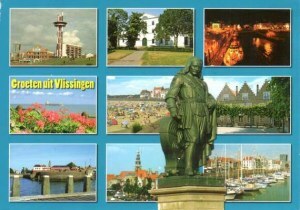 In the 17th century Vlissingen was a main harbour for ships of the Dutch East India Company (VOC). It is also known as the birthplace of Admiral Michiel de Ruyter. Vlissingen is mainly noted for the wharves on the Scheldt where most of the ships of the Royal Netherlands Navy (Koninklijke Marine) are built.